Hello Experience, hello new kitchen, hello riggs. Riggs is the place where entire kitchens are realized in one stop, and appliance shopping is all about you. See it in action! Schedule your visit. Riggs is the exclusive distributor of Sub-Zero, Wolf, Cove, and ASKO products in Northern California and Hawaii. With these powerful brands, there’s no reason to look anywhere else. Our brand of appliances are our specialty. Amazing kitchens come together when we collaborate with specifiers who know design and how to bring the elements together. In one great partnership we work creatively with specifiers to elevate the whole experience for the consumer. Ready to Purchase? Visit a Living Kitchen to Get Your New Kitchen Cooking! The new kitchen is underway. Plans are drafted. Details integrated. Space planned. Appliances still to select. 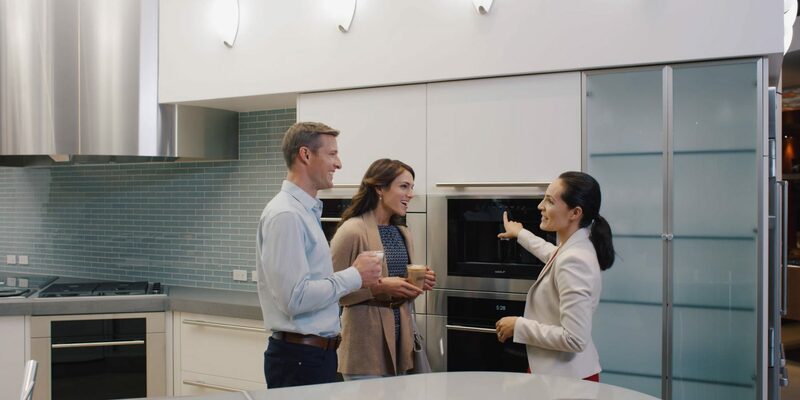 Touch, turn and twist your way to decisions as you settle on the right appliances for your new kitchen. Headquartered in Burlingame, California, our warehouse, offices and showroom together equate one facility as multifaceted as the team behind the scenes. Our long-standing relationships are testament to the value we place on taking care of our loyal customers: Consumers and trade partners alike. Your good taste deserves a reward. We are happy to pass along cash-back offers and bonuses to those who choose the finest appliances in the world.